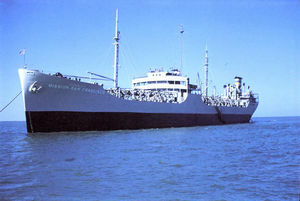 USNS Mission San Francisco was one of 27 Mission Buenaventura Class fleet oilers built for Navy service during World War II. The 524-foot-long tanker was launched in September, 1945, too late for duty in that war, but she actively served as a transport of volatile jet and diesel fuels for the Navy until March 7, 1957. On that day it was destroyed in a fire an explosion after the Liberian freighter Elna II struck her broadside on the Delaware River. The tanker, under the command of Captain William C. Allen, was moving up river early that morning when the Elna, which was proceeding downstream, collided in passing. The gas-enriched tanks on Mission San Francisco blew up, splitting the ship in half and killing ten crew members, including the captain. 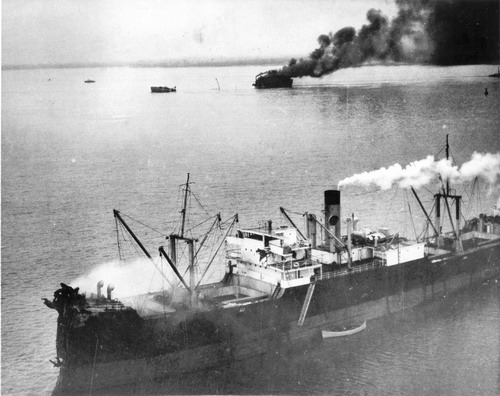 The Elna II backed off, but in her attempts to avoid the burning tanker, she ran aground. The Coast Guard worked in severe weather that day to rescue 59 survivors of the fiery tanker as well as the crew of the stranded freighter. It battled the fire for five hours before the tanker eventually sank. The Navy declared the wreck unsalvagable. In litigation that followed, a circuit court of appeals found that Mission San Francisco's faults in the mishap "were grave" but in following the old common rules of the sea, divided the $3.8 million in damages between the two sides. Those archaic laws, that always found both sides of ships in collision equally responsible, have since been stricken.